The National Weather Service (NWS) in Norton, MA has issued a *Winter Storm Warning* from 7 PM tonight until 10 AM Wednesday. A widespread 6-10" snowfall is expected. 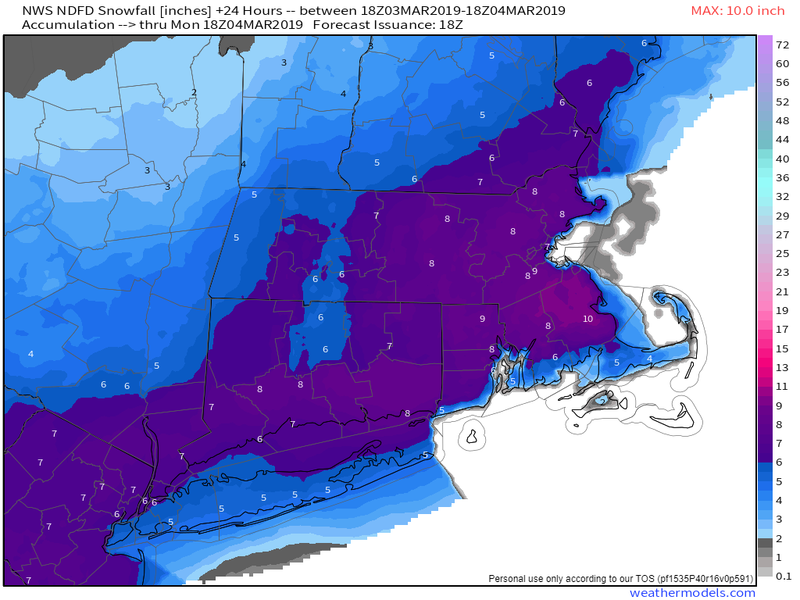 This storm will be the biggest of the season in Boston, surpassing the 3.6" on February 18. November 15, 2018, is the high snow mark for Worcester and Providence so far this season. 7.8" fell in Worcester while 6" fell in Providence. Both of those records should fall tonight/tomorrow morning, though Providence is more of a lock than Worcester. I've had a lot of questions from inquiring minds wondering what the deal is with this storm. Let's answer in those in a Questions and Answers blog. It's pretty nice this afternoon. Is it really going to snow? Partly to mostly cloudy skies will give way to all clouds later this afternoon, but before that happens, a few breaks of sun will help keep temperatures in the upper 30's and low 40's. However, they will fall into the upper 20's and low 30's this evening. It is not a classic "noreaster" set up because there is no cold Canadian high pressure to our north supplying the region with a fresh supply of Arctic air. The first few hours of snow will fall with temperatures near freezing so expect so wet flakes to start. By 1 AM, Worcester County will be in the upper 20's. So it won't be a powder bomb like Thursday morning, but it also won't be a heavy wet "spring" snow either. What is the storm doing right now? The storm is currently dropping snow across Missouri, Illinois, Indiana, Ohio, and Pennsylvania. The south is seeing heavy rainfall and severe weather. The presentation on satellite is also impressive. It is still in the process of maturing, but it is going to have the classic "leaf" or "comma head" by the time it is moving past Southern New England. At the surface, we see strong high pressure descending into the Upper Midwest and into the Great Plains. 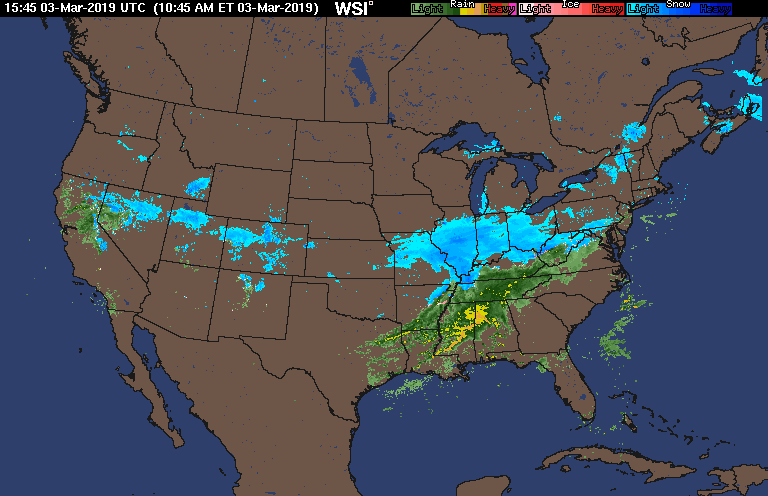 The radar confirms the amount of precipitation available as this surface low works across the Southeast and starts to re-develop off the Mid-Atlantic coast. Okay cool, but when does it start? 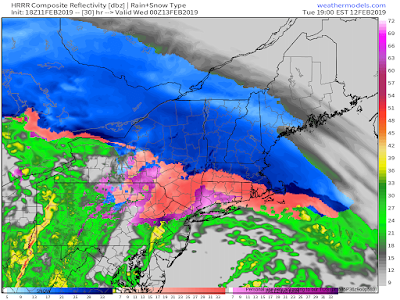 Snow will begin to fall in Southwest Connecticut after 5 PM and will get into Worcester in Boston around 7 PM (give or take). 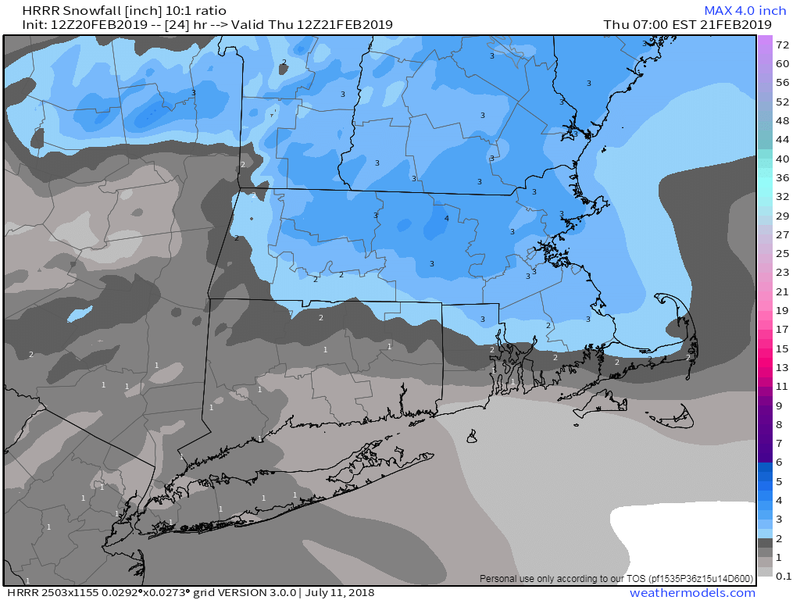 As mentioned before, temperatures will be falling into the upper 20's in Northeast MA and Worcester County, so expect this to start sticking to untreated roads right away. When will the heaviest snow occur? Expect snow to fall at moderate to heavy from 1 AM until 7 or 8 AM in Central Massachusetts, and until 10 AM in Eastern MA. The majority of snow accumulation will fall during this time period and travel will be extremely difficult. The low will deepen as it moves from the Mid-Atlantic coast to just Southeast of Nantucket. I think 1-2"/hour snow rates are possible as the low gains strength and slides to our southeast. This is likely in the region bounded by Boston, Worcester, Hartford, Providence, and Plymouth. The most likely time for these intense rates would be 2-5 AM. I see a sleet line in that radar loop. Will I get all snow? Almost everyone away from the Cape and Islands will see all snow. Sleet will mix in up to Hartford-Providence-Plymouth line we just discussed. A general 6-10 inches. The NWS is calling for 6-8" for almost all of the region. Some of the higher resolution models are going for 8-12". A few communities will see over 10" but I believe they will be the exception. I do think a lot of towns come in around 7-9" so for insurance, 6-10" for all regions except those that mix with rain and sleet. What about the Monday morning commute? Snow will still be falling at 7 AM in Central and Eastern MA and Rhode Island. It will ease up by 10 AM. With the bulk of the snow falling just before the commute, I expect a horrendous morning on the roads for those who have to be on them. I think most schools will close. Leave in the comments on the Facebook page or @zgreenwx on twitter. A quick hitting storm will bring plowable snow to Southern New England on Saturday. A second storm will bring even more significant snow overnight Sunday into Monday morning. Let's get into it. A *Winter Weather Advisory* is in effect from 1 AM Saturday until 7 PM Saturday. The heaviest snow will fall in the morning, with a break mid to late afternoon. A second batch of light to moderate snow will move through Saturday evening. There will be no issues this evening. Temperatures will be in the mid to upper 20's. Temps in Northern RI, Central, and Northeast MA (including the city of Boston) will be in the mid to upper 20's tomorrow morning. From Providence to Plymouth south and east, temperatures will be in the low 30's. This means that the snow will be a bit fluffier the further north and inland you go, and wetter and heavier the further south and east you get. Snow will reach Southern Worcester County after 4 AM. The snowfall intensity will pick up between 7 AM 12 PM. Snow showers will linger Saturday afternoon in Central MA, while steady snow will continue in SE MA and RI until the mid to late afternoon. Snow accumulation will be highest south and east of Hartford, Worcester, and Lowell. The jackpot will likely be somewhere from Providence to Plymouth. In the Blackstone Valley, expect 3-5" of snow. Sunday will actually be pretty nice, although there will be snow on all the sidewalks and lots of puddles from some of that snow melting. The March sun angle is quite strong so even with temps "only" in the upper 30's, it will still feel comfortable. It is all a tease, as the morning sun will give way to increasing high clouds as the next storm approaches. This storm will start as snow for everyone. Snow will begin after 7 PM, with snowfall rates increasing after midnight. 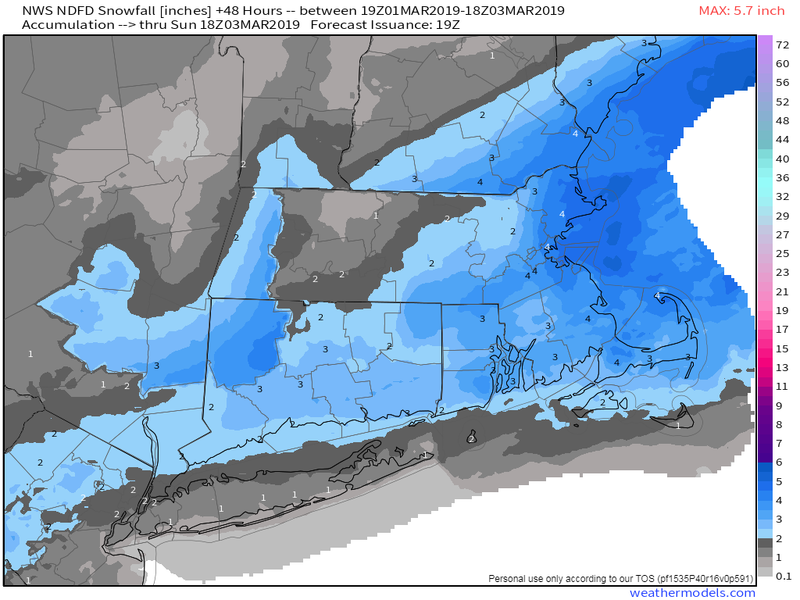 The EURO model drops 4-8" of snow before changing to rain inside 495 and south of the Mass Pike, including the Blackstone Valley. Other models have more snow. There is still plenty of time to evaluate the precipitation type for this one. It will definitely begin as all snow and even if it does turn to rain, the morning commute is going to be a mess. The good news is, this system will be gone by lunchtime. Opening bids for snowfall accumulation is 5-10" in the Blackstone Valley, with highest totals outside 495 and north of the Pike. A *Winter Weather Advisory* has been issued from 7 PM tonight until 7 AM Tuesday morning. A light, fluffy snow will begin to fall this evening. Snow rates will not be all that intense, so snow removal technicians will be able to keep up with it. Most cities and towns will see 3-6". The highest amounts will be along and north of the Pike. Snow falls lightly from 6 PM until 9 PM. The roads will start to become snow covered quickly, with temperatures between 15-20 degrees. Snow may fall moderately at times between 9 PM and 5 AM. It will quickly taper to just snow showers between 5-8 AM, ending just before or during the AM rush. You can use a backpack blower or a broom to get rid of this stuff tomorrow AM. Compared to the frozen slop we have had to clean up so far this winter, this is a welcome change. If a heavy band of snow does indeed set up, some localized communities could see over 6". This will be the exception, not the rule. I don't think this is the last snow chance of the winter. There are several snow chances in the next 1-2 weeks. I'll keep you posted. Strong Winds to Bitter Cold to...A Real Snow Event? It has been a wild day so far across Southern New England. Snow squalls caused some travel issues this morning but the main story is the strong winds. A *High Wind Warning* continues until 7 PM this evening. The wind will relent somewhat this evening and overnight. Temperatures will fall into the low teens by Tuesday morning and will only rebound into the low to mid 20's Tuesday afternoon. The coldest air of the week arrives on Wednesday morning with lows in the single digits. It will help set the table for a probable plowable snow event Wednesday evening into Thursday morning. As of 402 PM, 63926 customers were without power in Massachusetts. The worst is happening right now. You can find the latest wind reports here and the latest wind damage reports here. The highest gust I have seen so far is 69 MPH in Cambridge, MA. Worcester has reached 60 MPH and Mendon has reached 59 MPH. The strongest wind gusts will diminish shortly after sunset. Winds will remain gusty, but the power outages and tree damage should begin to slow down. It will be sunny and breezy tomorrow. Although the threat for damaging winds decrease tomorrow, garbage and recycling bins will likely be blown around again. The coldest air of the week arrives Tuesday evening into Wednesday morning. 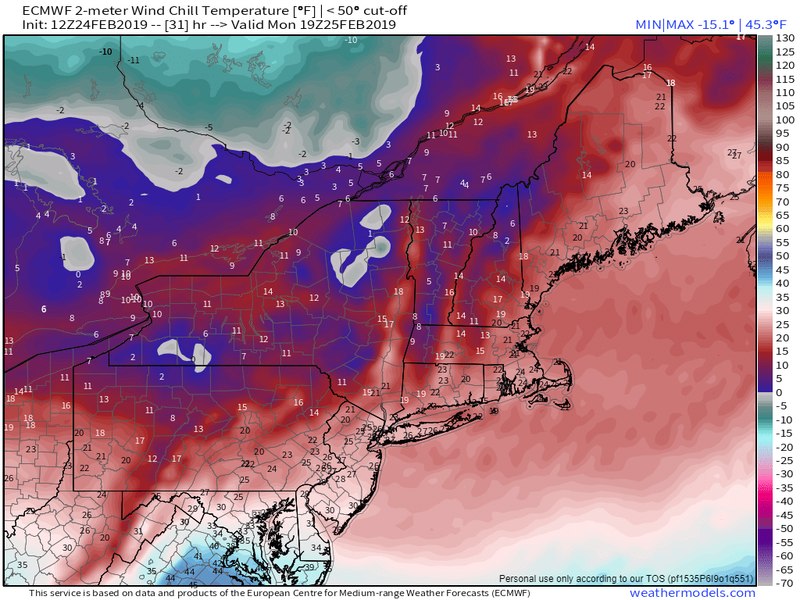 By 7 AM Wednesday, wind chill temperatures will -10 to -15 below. We then turn our attention to a clipper system them will emerge out of the Great Lakes, and perhaps strengthen as it passes South of New England. Most storms have moved through New England this season, which means a change over to rain, warm aloft, and other negative snow factors. Although this system may be moisture starved, the most recent computer guidance has a up to a 0.5" of precipitation by Thursday morning. That works out to 3-5" of snow. However, with temperatures in the teens Wednesday evening and favorable snow growth in the lower and mid levels of the atmosphere, that 3-5" could turn out to be more like 5-10". There will be no mixing concerns and this snow will be powder. The biggest questions is how much moisture/forcing will be available to produce snow. The NAM is on the lighter side, while the EURO is on the juicer side. I will have more on this tomorrow and Wednesday. With most of Sunday's precipitation behind us, a soggy Southern New England now must prepare for strong winds tonight through Monday evening. Winds out of the W and NW will be sustained at 20-40 MPH with gusts as high as 65 MPH possible. There is a real threat for damage to trees, power lines, and property. For that reason, the National Weather Service in Norton, MA has issued a *High Wind Warning* from 10 PM this evening until 7 PM Monday evening. Traveling will be difficult, especially for high profile vehicles. Surface low pressure is moving through Southeastern New England. Winds out of the northeast are allowing for the continuous drizzle this afternoon. This low is part of a larger storm system that is responsible for severe weather and flooding deaths in parts of the south, along with blizzard conditions in the Midwest and Great Lakes. This is part of the same storm system that brought snow flurries to Los Angeles and Las Vegas during the week. 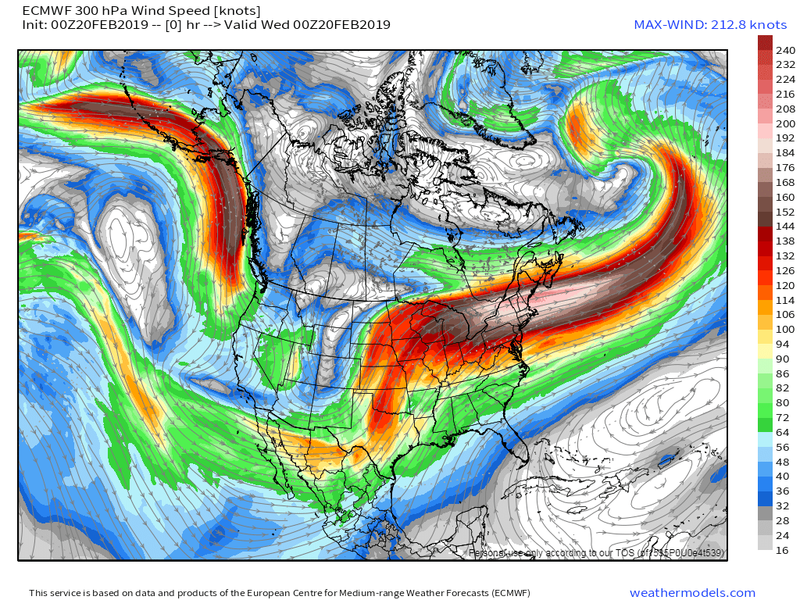 As the parent low decays in Southeastern Ontario, the secondary low (which is really an open wave) that brought the rain to New England will begin to absorb energy from the parent low as it tracks in the Canadian Maritimes. The secondary low will deepen into a strong storm with a pressure of around 970 mb. At the same time, strong, broad high pressure will descend into the Upper Midwest. It will have pressure around 1040 mb. Winds have not been a major problem so far this winter because temperatures have often increased from the surface into the lowest levels of the atmosphere. This is known as an inversion and acts as a barrier to keep the strongest low-level winds above our heads. This will not be the case tomorrow. Cold, dry arctic air will begin spilling in from the Northwest this evening. This is an efficient way for the low-level winds to reach the surface. Temperatures this evening will fall from the low 40's to the upper 20's by morning. Temperatures will stay in the 20s for most of the day in Worcester County and Northeast MA. 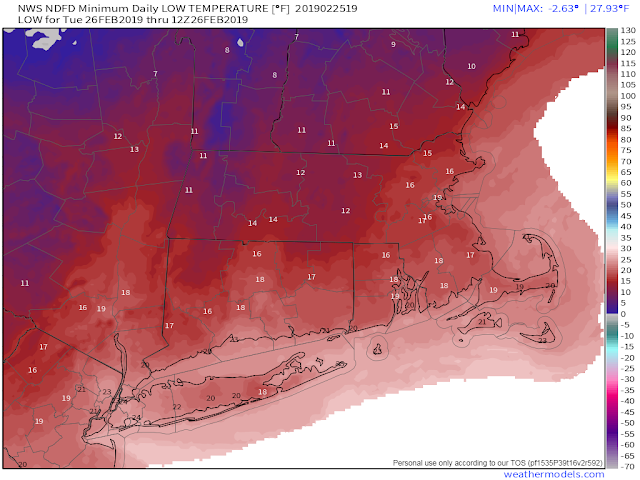 Temperatures will rise into the low 30's across Southeast MA. It will feel much colder thanks to the roaring winds. 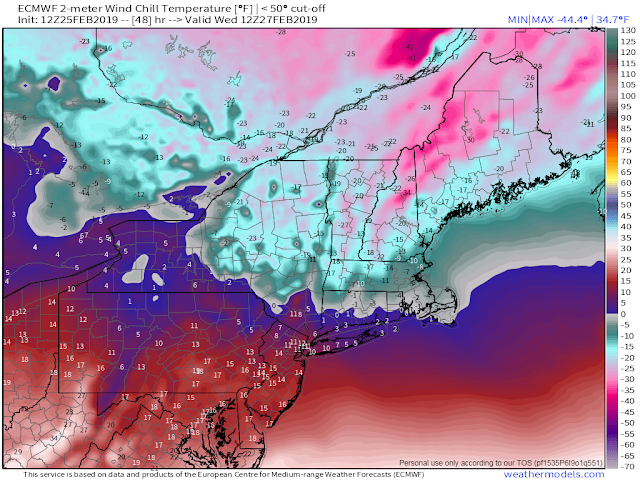 Wind chill values will be in the mid to upper teens in Western and Central MA and low 20's across Eastern MA. Winds tonight will begin to increase around 10 PM. Light sleepers are in for a rough night as wind gusts will slowly increase from 30 MPH to 45 MPH by morning. The potential overnight is for isolated to perhaps scattered power outages from downed tree limbs. There is also the potential for snow squalls that will hit at various times overnight through the morning commute. The snow squalls will not only cause briefly hazardous travel conditions but also will serve as the entrance music for the main event. The main event is sustained winds of 20-30 MPH with winds gusts of 45-65 MPH from 10 AM to 6 PM. Scattered to widespread tree and powerline damage is likely. Wind gusts of 60+ MPH are most likely between 1-4 PM. The winds will only relent somewhat on Tuesday. Temperatures will also be colder, with wind chill temperature near or just below 0 in the morning and will not improve much during the day. The coldest day of the week is Wednesday, with wind chills -10 to -15 below Wednesday morning. If your power does go out, it may be a few days for it to come back on. These cold temperatures will be living in unheated buildings unrealistic so you may want to consider a backup plan, just in case. I think tomorrow's event will be more widespread in magnitude thanks to the amount of precipitation that has fallen in Southern New England since last summer. Just in Southern Worcester County, observations taken at Worcester Airport and the Blackstone River at Sutton Street/Providence Road in Northbridge show anomalies of + 15.00" since July 1, 2018. These anomalies exist all across Southern New England. The Quabbin reservoir is 100.6 % full and the Wachusett reservoir is 93% full. It wasn't all that long ago (2-3 years) that moderate to major drought conditions were widespread in New England. While that is good, the water table is nearly full. The soil has lots of moisture. Again, that is positive on the agricultural side it will also make trees uproot more easily. March and April are also months where we tend to get a lot of rain. It will be interesting to see if the precipitation trend continues. If it does, big river flooding trouble is in our future. In the meantime, stay safe tomorrow. Stop me when you've heard this forecast lead before; a fast moving winter storm will start as snow tonight before changing to sleet, freezing rain, and plain rain after midnight. 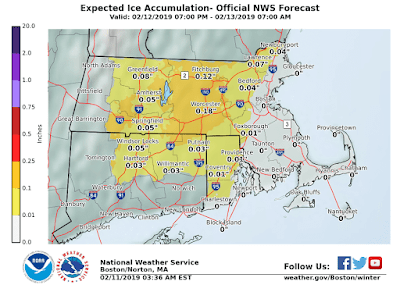 Light snow and ice amounts are expected but the Thursday AM commute is likely to be slippery in Central, Metrowest, and Northeast Massachusetts. 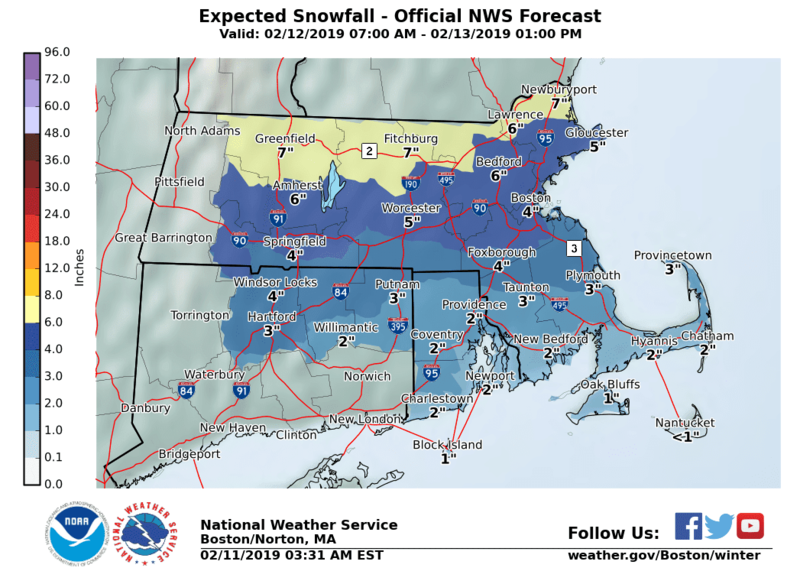 The National Weather Service in Norton, MA has issued a *Winter Weather Advisory* from 7 PM this evening until 7 AM Thursday morning for all of Southern New England except for the Cape and Islands. A Winter Weather Advisory means periods of snow, sleet, and freezing rain will cause travel difficulties. Expect slippery conditions and use caution when driving. Strong high pressure is control today. Temperatures started in the single digits and teens and they will rebound in the low to mid 20's. 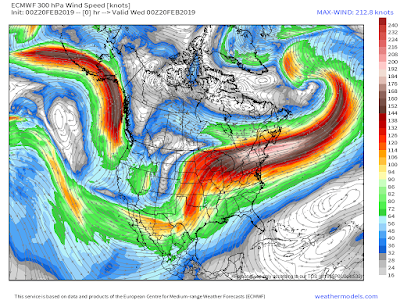 Fun fact- the jet stream is ripping along above our heads. A flight was measured at 801 mph as it got embedded in 200+ mph winds around 35,000 feet up. This is good if you are flying to Europe, bad if you have to fly to the west coast. The fast jet will keep traffic in the atmosphere moving along. The high pressure will slide east today as a storm system develops along the Gulf Coast, lifts northeast, and reforms near the Mid-Atlantic coast. High level clouds will increase throughout the day, but precipitation will hold off in Central and Eastern MA until after 7 PM. 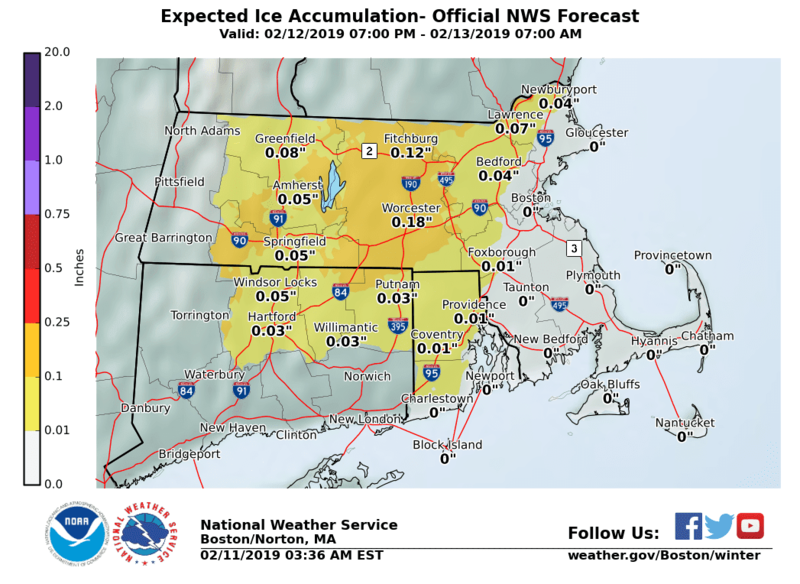 Cold surface temperatures will linger in Central and Northeast MA all night so it is likely that all precipitation that falls will be frozen north of a Brockton to Foxboro to Smithfield, RI line. However, temperatures on Thursday will rise into the 40's across most of Southern New England so we aren't worried about everything turning to cement. 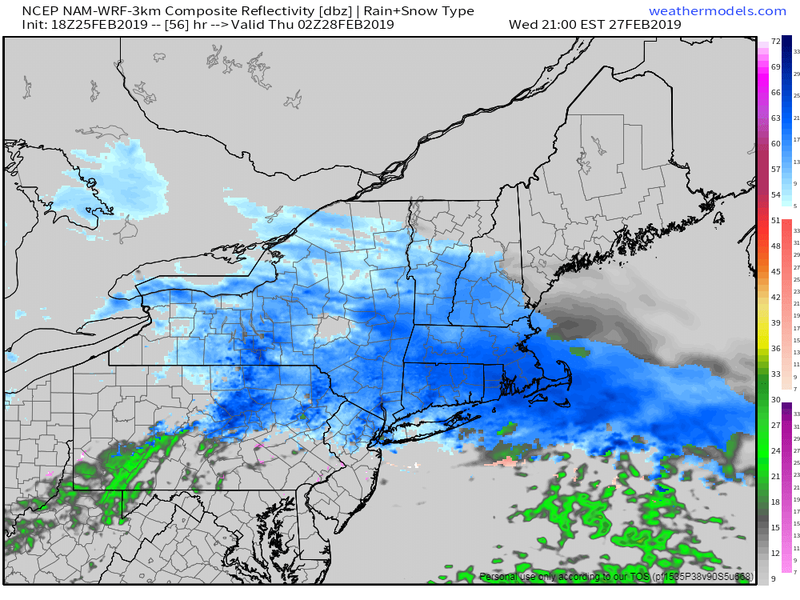 Snow will begin after 7 PM in Worcester and Boston. Snow will be light from 7 until 10, increasing around 11, and peaking from 12-2 AM. Between 2-3, snow will transition to sleet, freezing rain, and rain. All precipitation ends around 6 AM. Although surface temperatures will be in the mid 20's across Central and Northeast MA, warm temperatures aloft will limit the ability for snow growth in the mid layers, limiting snow totals on the ground. That said, a general 2-4" is likely followed by up to 0.10" of ice. Some communities closer to the NH/MA border could see up to 4". For the Thursday AM commute, traffic is lighter than normal this week thanks to school vacation. That will help keep congestion down, but it will still be a slow go. Unlike last weeks storm, precipitation will end closer to 6 AM, which will delay the clean up. I anticipate the main roads being fine, but untreated side roads will be slippery. If you have the option to work from home, it is a not a bad idea to exercise that right. The roads will be fine by the afternoon, but why spend the time commuting when you can be working? (Practicing for my boss). I will update again if needed. A winter storm will bring snow, sleet, freezing rain, and rain to Southern New England Tuesday afternoon into Wednesday morning. Snow will begin Tuesday afternoon and will fall moderately to heavy at times through the evening commute. Snow will transition to sleet and freezing rain after 7 PM and will change to rain after 1 AM. The rain will end before the Wednesday AM commute. A *Winter Storm Watch* is in effect. Some parts of this watch will be converted to a warning, while others will be converted to an advisory. Either way, the impact to the evening commute remains the biggest threat. High pressure is currently building to the north. Light northerly winds will bring cold, dry air into Southern New England this evening. By morning, temperatures will be in the low to mid-teens. Temperatures will be in the low to mid 20's when precipitation arrives as snow Tuesday Afternoon. Snowfall rates of 1-2"/per hour are possible between 3-7 PM. Snow transitions to sleet and freezing rain from south to north starting after 6 PM. Warm air will begin to move in aloft. It should reach the Worcester and Boston area after 7 PM. Frozen precipitation will fall until 1-2 AM before finishing as a bit of rain Wednesday morning as surface warming finally catches up to the warming aloft. A general 3-6" of snow will fall before the changeover to sleet and freezing rain. A total of 0.1 to 0.2" of ice accretion is expected, which is below damage thresholds. Overall, this is not a huge deal except for the snowfall during the Tuesday PM commute. It also adds more water to the system, which is near capacity. If this weather pattern continues, spring flooding is going to be a story around here.